Meatloaf is a favorite in this house. I think I've made all kinds of meatloaves over the years. I have to say, I rarely use a recipe anymore...and because of it, my meatloaves vary from time to time. I tend to stick to one kind of meat in my loaves, cuz that's how I like to roll. I've made meatloaves with turkey and beef, and occasionally, I will add a bit of pork in via bulk sausage, but I think I like the single meat meatloaf best. I realize home style means different things to different people. To me, it means a recipe that seems like it has been around for decades. Something that is made with simple and honest ingredients. Something your mom or grandma used to make on a regular basis when you were little. I think this meatloaf tastes like that. Last month, for my AR Allstars assignments, we were given coupons to purchase some new Birdseye® products called Recipe Ready®. I used the free product to make two dishes with recipes we were required to use, but I also picked up a third bag and paid for it on my own. 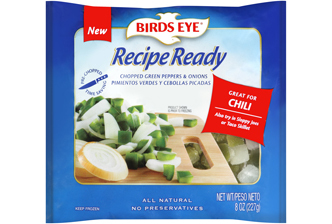 The third bag I picked up was the Green Pepper and Onion Blend. I picked it up with the intention to use it in a meatloaf. Frozen, pre-cut vegetables are the PERFECT ingredient to put into meatloaf. Frozen vegetables, for the most part, tend to soften up once they are frozen, making it the perfect addition to things like meatloaf for flavor and moisture. Of course, you can use fresh peppers and onions, but you need to not only take the time to clean and dice, but also to precook them so they aren't hard pieces in the finished meatloaf...because in my experience, the vegetables never get soft enough if they go in raw. Here is a pic of the product I used. These are presently available at Wal-mart for purchase. Using this product in the meatloaf recipe below eliminates the need to clean and chop and also pre-cook, which makes putting together this meatloaf a snap. The peppers and onions cook down nice and soft, giving the meatloaf flavor but no "crunch". And moist? Yup, this loaf is nice and moist even when you use a lean ground meat, such as sirloin. With a side of mashed potatoes and a nice big smothering of mushroom gravy...it's comfort food you will be wanting again and again. 2. In food processor, grind up the bread to make bread crumbs. You can also just tear the bread into small pieces. This works fine. Using a food processor makes the bread crumbs smaller and more even, giving the meatloaf a more homogenous appearance. I prefer to put them in the food processor. Pour the bread crumbs into a large mixing bowl. 3. On top of the bread crumbs, add the milk and let it soak in for a few minutes. 6. Bake in 350 degree F oven for about an hour and 10 minutes, or until internal temperature reaches 160 degrees F. Allow the meatloaf to "rest" loosely covered in foil for about 10-15 minutes before slicing it. Like I mentioned meatloaf is a staple in my house. Everyone in my family enjoys it. 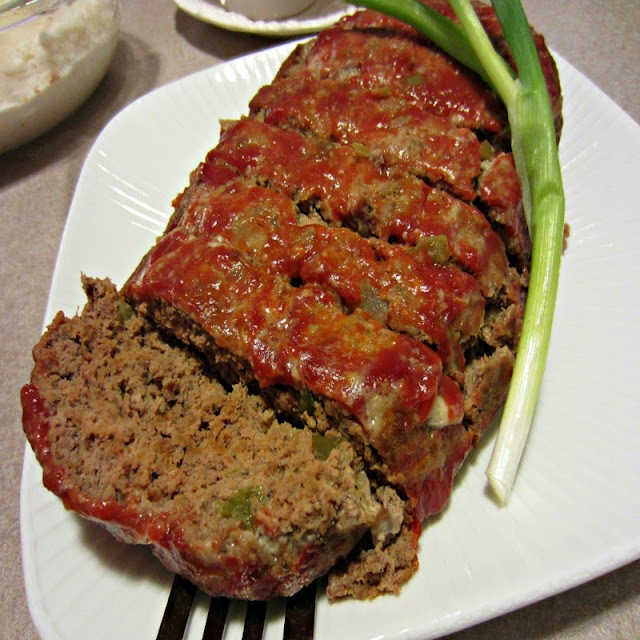 You can even prepare this meatloaf ahead of time and put it in the refrigerator over night. Take it out of the fridge about a half hour before baking it and than just bake it the next day. Meatloaf also freezes very well once it's cooked. If you aren't a fan of thyme, swap it out for marjoram. I happen to like thyme and peppers together. I really love that meatloaf is one of those things you can really "make your own." So many possibilities. By using lean ground beef, you can keep the calories in check. By adding the fresh bread and milk along with the frozen vegetables you can keep it moist. No one likes a dry meatloaf. How about you? Are you a meatloaf fan? Is there anything special you put in your meatloaf to make it "your own"? hmmmm...wonder what's in her killer meatloaf? lol This one is good, might at the very least give her a run for her money! Thinking this would be great with tomatoes and cucumbers on the side for a simple make ahead lunch. Yes! that would be a great accompaniment! TOTAL MEATLOAF FAN! And I so need to eat through my screen to get to this meatloaf. Dying, woman! I need meatloaf this week! It's my ultimate comfort food, along with mashed potatoes. YUM. Thanks for the tip on the frozen veggies - I have to try that! I have always enjoyed meatloaf. I like your use of frozen veggies, so easy with no prep! I've been craving some good old fashioned meatloaf. Thanks for the recipe! Yummy looking meatloaf! I love your food blog & just bookmarked it for the future explore. Will try with your recipe soon! I haven't made #meatloaf in forever. This recipe reminds me how much we like it. Thanks Renee. On my "to do" list! This is one of those recipes I make again and again. I hope you give it a go sometime!